This prayer request page is full - we can't publish any more comments we receive on this page. Please leave your prayer request on the New Prayer Request page (Link) where we can respond. Thank you. As stated here, please do not turn to psychics, witchdoctors or other occult practices or practitioners to get rid of demons. An exorcist explains why this won't work. The following message concerning this topic was sent to BoldRadish on YouTube. The name of the sender will not be given. However, reading this individual's message and the replies may help you begin the process of dealing with the evil that has begun attacking your life. Hi ____, I have been attacked & scratched. I have worked with a paranormal group & currently a demonologist, they got rid of one, ( i know this sounds crazy but I know their is more then one, they have different personalities because the behaviour of thngs the that they do & what makes them leave from is different ) A priest, from my sisters parish, was at my home 3 months ago to bless it. but when I started talking about 'things' he left & did not return any of my emails.yesterday I went to confession to talk to that priest, he was on vacation so a priest, not from the parish was hearing confession, & he told me to contact the archdiocese of _____. he said I need to have an exorcism. I sent them an email last night. But the odds of hearing from them is 1%, I am not being negative just practicile. I do not belong to any church. I should join but the church is my district, when i asked for help the priest yelled at me. And told me to call the police. I don't know what to do. Do you have any suggestions? my email is ____. thanks in advance for any help you can give. That priest was weak and wrong and terrible not to help you. Forgive him and forget about him, do not go to him for anything. He is unknowingly helping demons by not helping you get rid of them. I contacted my archdiocese for something and they did help me. If they don't reply after a few days, call them and keep asking until you can find a priest who will at least bless your home. You cannot stop or be discouraged, you must be persistent. This journey isn't about the priest who failed you but about the eventual cleansing of your home. You will succeed if you persist and do not turn astray. Do not turn to palm readers or any sort of occult practice, that will always make it much, much worse. Do not take God's name in vain, do not take Jesus' name in vain. It is by the Lord's name that you will be freed from this oppression, so make sure not to say "oh my god" [or "g**dammit"] or use Jesus' name as a swear word [or an exclamation of surprise] or anything like that. Not every priest is an exorcist, only the best priests can be exorcists, but any priest can bless your home. I'm not a priest, I'm a layperson. You don't have to join a church to start praying, you can start praying right now. Demons hate prayer. They hate the rosary and they hate the chaplet of divine mercy. Religious icons or pictures, the crucifix especially, they hate. When they hate something, they leave. If they see that bothering you causes you to turn towards God, they leave. Each case's difficulty is different, some are more difficult than others and take more time. You can print out pictures of a crucifix and other pictures from the internet right now, if you can't afford to buy pictures. You should wear a sacramental medal of Saint Benedict. Look to buy a medal online that has been blessed by a priest. You can purchase inexpensive crucifixes anywhere online. Demons don't care how much they cost, they still hate them. Anoint the crucifix with holy oil when you get it. All saints are loathed by demons, but there are some frequently hated by them. It depends on the demon which saint it especially hates (I think it's an individual personality thing, and there are both so many saints and so many demons). Find Catholic prayers to Saint Michael the Archangel, Saint Rafael the Archangel, Saint Pio of Pietrelcina, Saint Philomena, Saint Anne, Saint Clare, Saint Maximillian Kolbe, and/or Saint Therese and start asking those saints to pray to God to get rid of the demons and ask God and those saints bring you a good priest to spiritually guide you and help you. Do not give up if it takes time. They will help you. They are holy souls and they can drive out demons in the name of Jesus. Pray the Rosary of Liberation, I have a video of it called the Rosary of Jesus Freedom. This rosary of liberation is different from the rosary I mentioned earlier, but both are important. Every Catholic Church, no matter how faithless the priest is, has to have a free dispenser of holy water somewhere near the doors of the back of the church. It is usually in something that looks like a metal cylinder or a metal water dispenser. If you can't find it, you can ask somewhere where you can get holy water. Tell them that you want to bless your house with it. Take a Thermos or some sort of secure container and put some holy water in it. Sprinkle the holy water around your house and on you. Just drops, very little, will do. You can even pray something very simple like, "in the Name of Jesus, leave!" Do not ever, ever communicate with demons except to say "in the Name of Jesus, leave!" Say it in a commanding voice. Demons are cowards and fools! Don't listen to them or talk to them. Open up a screen on your browser and do a search for: online Eucharistic Adoration. Or print out a picture from an image search of the Eucharist. This is very powerful, leave this image up. Read them out loud if you want. Especially read the parts of the Passion of Jesus and the Resurrection. Demons hate this. There is also a movie documentary called The Exorcist in the 21st Century that you might want to watch which is about Fr. Fortea. It interviews exorcists and non-believing priests and might shed light on your priest who wouldn't help you, as well as on a real priest who acts like he should. There is also a part at the very end where Fortea speaks a prayer in tongues and I think listening to that or playing that part will help you. That should get you started. You must keep going with it. Thank you so much for your reply. Wow!!!! Yesterday, last night & also today I blasted the end of the video you posted of the last 10 minutes over & over. It helped a lot. never heard of many things in your e-mail. I will get to it. I went to catholic school for 10 years and never once did anyone ever mention "War Payers" to me. I was pleasantly surprized to hear from Archdiocese of ____ by email tonight. I remembered some additional information that might have helped this person or anyone suffering from these problems. I will also provide links to the information I mentioned above, as well as to additional information. Saint Michael the Archangel warrior prayer video by Christopher Weirich. Very powerful, if the above video embed doesn't work, click here to watch it on YouTube. An exorcist can only perform an exorcism in his own diocese. He is not permitted to perform exorcisms outside of his diocese. Here is a complete list of Catholic diocese in the United States, as well as their websites which will have email addresses listed on them. If you can't find an exorcist in your diocese, you will have to travel to another one. As previously mentioned, any priest can bless a home. (If you are not in the United States, the following search term should bring up a list of dioceses in your country: list of diocese in [you country's name]). All of these "war prayers" are good for driving out demons. But you must "put on the armor of God so that you may be able to stand firm against the tactics of the devil"(–Ephesians 6:11) if he should try to return to your home or your person. The same war prayers are also a strong defense against future attacks. If you watched The Exorcist in the 21st Century, note the issue of forgiveness that comes up in the argument between the bishop and the demon possessing Constanza. While it is important to stay away/avoid contact from or even thoughts of those who are harming you (including those who are lying to you, tearing you down, degrading you, refusing to compromise, discouraging you, encouraging you to do self-destructive things or who are physically, emotionally, or psychologically harming you), it is important to forgive those people and show an act of forgiveness by praying that they do not go to Hell. If thinking of this person or persons who hurt you causes you distress, you must not think of them (even to pray for them): "For grief can bring on death, and heartache can sap one’s strength. ... Do not turn your thoughts to him again; cease to recall him; think rather of the end. "–Sirach 38:18 and 38:20. If you unwillingly recall the person who betrayed you, or if you are angry, tell God that even though you feel bad because of how you were hurt, you do not want this person to go to Hell. Try to avoid thinking about this person. Put his or her or their names in a prayer request and trust that others will pray on your behalf. You can also spiritually bind evil spirits or people who are cursing or afflicting you in the Rosary, because of the Rosary's great power. This will break the bond between you two. Any time the bond between you two is re-opened, you can re-bind it through the Rosary. "Amen, I say to you, whatever you bind on earth shall be bound in heaven, and whatever you loose on earth shall be loosed in heaven. "–Matthew 18:18. A prayer to the effect of, "I bind [list of people, dead or alive, who have impacted your life in a way that is harmful to you or who you have painful memories of or spiritual ties to] and all demons afflicting me by the power of the Holy Name of Jesus and through the Rosary of the Blessed Virgin Mary." One of the promises of the Rosary is that all that you ask for through the Rosary will be granted you, so adding "in the Name of Jesus and through the Rosary" to the end of requests to God is a way to have Him hear you. As far as saying the Rosary goes, the scriptural Rosary is stronger (that is, a Rosary that includes quotes from scripture. The Our Father and Hail Mary prayers are based on scripture, but a scriptural rosary contains more than just those instances of scripture. For example, it will quote passages from the Bible that the mystery is based on, or will quote psalms or another book from the Bible). In addition there is the devotion to Mary Undoer of Knots, in which special prayers are inserted between mysteries of the Rosary. The premise is that Mary undoes the knots that tangle a person's life: the knots of demonic problems, curses, sin, poverty, sickness, unhappiness, lack of confidence, etc. I forgot to mention the Brown Scapular of Our Lady of Mount Carmel. The Brown Scapular is a image, usually of Our Lady of the Brown Scapular (although of any saint, I've had one with Saint Michael and am wearing one with Saint Joseph), that is worn under clothing (around the waist, around the neck, or under one arm as a sign of obedience to God). It is a sign of very, very powerful protection. There is a very easy to read article about the Brown Scapular here. Point #3 lists the promises of the Brown Scapular. It is very important to wear and if you can find a priest to enroll you in the Confraternity of the Brown Scapular, that is even better. You can purchase a brown scapular online. If you have no money, there are free brown scapulars here. Again, anything that demons hate and that bind you to God are going to work in your favor. You can also purchase a Brown Scapular online that has medals attached to it (for example, a medal of st. benedict and also a crucifix, so that you will be wearing a st. benedict medal, a crucifix and a brown scapular at the same time). "From long experience I have learned that there is nothing like holy water to put devils to flight and prevent them from coming back again. They also flee from the Cross, but return; so holy water must have great virtue. For my own part, whenever I take it, my soul feels a particular and most notable consolation. In fact, it is quite usual for me to be conscious of a refreshment which I cannot possibly describe, resembling an inward joy which comforts my whole soul. This is not fancy, or something which has happened to me only once. It has happened again and again and I have observed it most attentively. It is, let us say, as if someone very hot and thirsty were to drink from a jug of cold water: he would feel the refreshment throughout his body. I often reflect on the great importance of everything ordained by the Church and it makes me very happy to find that those words of the Church are so powerful that they impart their power to the water and make it so very different from water which has not been blessed. One night, too, about this time, I thought the devils were stifling me; and when the nuns had sprinkled a great deal of holy water about, I saw a huge crowd of them running away as quickly as though they were about to fling themselves down a steep place. I will only describe something that happened to me one night of All Souls. I was in an oratory: I had said one nocturn and was repeating some very devotional prayer which follow it–they were extremely devotional: we have them in our office-book–when actually the devil himself alighted on the book, to prevent me from finishing the prayer. I made the sign of the Cross and he went away. I then began again and he came back. I think I began that prayer three times and not until I had sprinkled some holy water on him could I finish it. At the same moment I saw several souls coming our of purgatory: their time there must have been nearly up and I thought that perhaps the devil was trying to impede their deliverance." –From the Autobiography of Saint Teresa of Avila, Chapter 31, 1562 A.D. If you are suffering from some sort of ailment caused by someone hurting you (for example, if you have become depressed because you have been mistreated, betrayed, etc. ), do not reject medicine for it, if you are seeking medication. God works through others, as we can see with His prophets in the Old Testament and His Apostles in the New Testament, and His faithful religious in the present day. Medicine is a noble profession because God uses it to heal His children (whether the doctors know that or acknowledge that or not). (Read Sirach 38:1-8.) God is sending doctors and others to heal you. Pray to God that you are healed, even if the healing comes through a doctor. And obey the orders of the doctor as if God is working through the doctor (unless the doctor is telling you to sin, which won't heal you). The Exorcist in the 21st Century is available on Amazon.com's Instant Watch section. The Secret of the Rosary by St Louis de Montfort, online free. Also available on this website for free, if you prefer a more beautifully decorated web page. Demons and Exorcisms in the Gospels, as well as mentions of demons. Cross-reference with Online Bible. Gospels, the Passion of Jesus, from the Betrayal of Judas Iscariot to the Resurrection: Luke Chapter 22 (in which Satan enters Judas) through 24; John Chapter 13 (Jesus is arrested by Chapter 18) through Chapter 20 (or 21 for the final discourse with Peter in which Jesus forgives Peter's thrice betrayal), Matthew, Chapter 26 through 28; Mark Chapter 14 through 16. Religious images are used all through bold radish prayer videos as well as many other prayer videos put up by other people on YouTube. They are available on the prayer request post too (along with summaries of some of the Saints lives) but several more can be found online if you do an image search for a specific saint and put the word "art" or "painting" or "stained glass" behind the Saint's name in the search (for example, Saint Michael Painting might be the words of your image search). SQPN's Saint Database has several images as well as the names of thousands of Saints, organized by patronage. Rosary of Liberation chaplet explanation with stories. Quick and silent Rosary of Liberation BoldRadish YouTube video. The entire Book of Tobit available online with annotations. 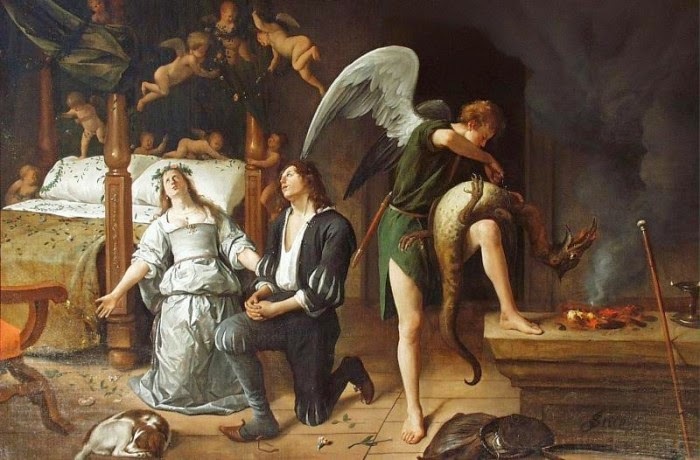 In this book of the Bible, Saint Raphael the Archangel is tasked by God to heal Tobit of his eye and financial problems and heal Sarah, a young woman who is suicidally depressed after being afflicted by the demon Asmodeus. The chapter in which Raphael expels the demon from Sarah's life. Complete description of the Saint Benedict Medal: "The medal is a prayer of exorcism against Satan..."
The prayers that you are doing and the getting rid of demons are considered good works. Praying for others' salvation is also considered good works. Read more about the importance of good works. Remember every time that you are afraid, recite the Hail Mary prayer repeatedly. The Hail Mary is composed of the Angelic Psalter, which is the scriptural quote from Luke in which Gabriel the Archangel announced to Mary the coming of God's Son, and the scriptural quote of Elizabeth when Mary went to visit her after receiving the annunciation. Angelic Psalter is therefore derived from the above, it is the quotes: "Hail, Mary, full of grace, our Lord is with you!" which Gabriel said, and "Blessed are you among women and blessed is the fruit of your womb, our Lord, Jesus Christ!" which Elizabeth said. It proceeds, "O Virgin Saint Mary," which Luke stated she was a virgin in Luke 1:27, "O Mother of God," which Elizabeth stated in Luke 1:43 ("the Mother of my Lord"), "pray for us sinners now and at all times and at the hour of our death." Completely, the prayer is: "Hail Mary, full of grace, our Lord is with you! Blessed are you among women and Blessed is the Fruit of Your Womb, our Lord, Jesus Christ! O Virgin Saint Mary, O Mother of God, pray for us sinners now and at all times and at the hour of our death! Amen." This prayer is so powerful because of the immense power of the Word of God to transform our lives and the world in the living Gospels. John 1:1-5 : "In the beginning was the Word, and the Word was with God, and the Word was God. He was in the beginning with God. All things came to be through him, and without him nothing came to be. What came to be through him was life, and this life was the light of the human race; the light shines in the darkness, and the darkness has not overcome it." We see that by reciting the Angelic Psalter, we are reciting God Himself, because the Angelic Psalter is comprised of quotes of God's Word, and John tells us that God is both with His Word and is His Word. We are bringing the life that God offers to our lips, to our life. God is being born into our lives, He is beginning our lives; He is ministering and healing our lives; He is suffering with us and for us so that we can be healed of our suffering and our sin, and He is resurrecting in our lives and resurrecting our lives, every time we pray His Word. This is why you pray the Hail Mary when you are afraid, and why the Rosary is so powerful over demons and all sorts of spiritual and physical evils. You don't have to say the Hail Mary out loud. But remember that Our Lady is the one who crushes the skull of the devil, as mentioned in pre-20th century Catholic Bibles in Genesis. "And I will put enmity between you and the woman, and between your offspring and hers; she will crush your head, and you will strike her heel." She is the holiest human (remember, Jesus is God, not just a human) who ever lived and the one who observed God's word the most. That is why she is the most amiable, kind, merciful, wise, intelligent and hopeful person who ever lived. That is also the reason that she is the model that all Christians (not just women, but all Christians, especially exorcist priests) are supposed to emulate, because she is the first and most perfect. When you pray, you are bringing God into the world and into your life, the way that Mary brought God into the world in human flesh the first time. The point of all this, though, is that the Hail Mary, honoring her, is one of the things that demons hate and fear the most, so reciting the Hail Mary repeatedly, when you are afraid or afflicted or angry or obsessed with a thought or trying to break a spiritual bond between you and someone destructive or trying to drive out demons, will cause demons to flee and will spiritually birth the presence of God into the world, into your life at that moment, giving you peace and fearlessness. So whatever situation you are in and you are afraid, demons involved or not, mentally recite some Hail Marys. Demons hate Hail Mary prayers. That is why the Rosary is so effective in getting rid of demons and curses. Saint Louis de Montfort's book The Secret of the Rosary (online, free) includes many instances of exorcisms done because of the recitation of the Rosary. I once talked to a priest who said "the Rosary is life." 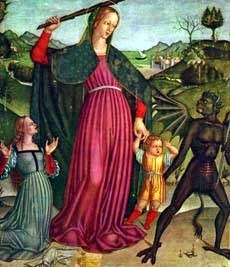 Rennaisance image of Our Lady of Succor (Help) protecting those who have asked her for help by clubbing a devil. Also, the real name of Our Lady of Guadelupe is the Aztec Nahuatl word Coatlaxopeuh, which means "who crushes the serpent." The miraculous image of Our Lady of Guadelupe is a powerful deliverance image. Demons hate it and will leave if it is honored reverently. 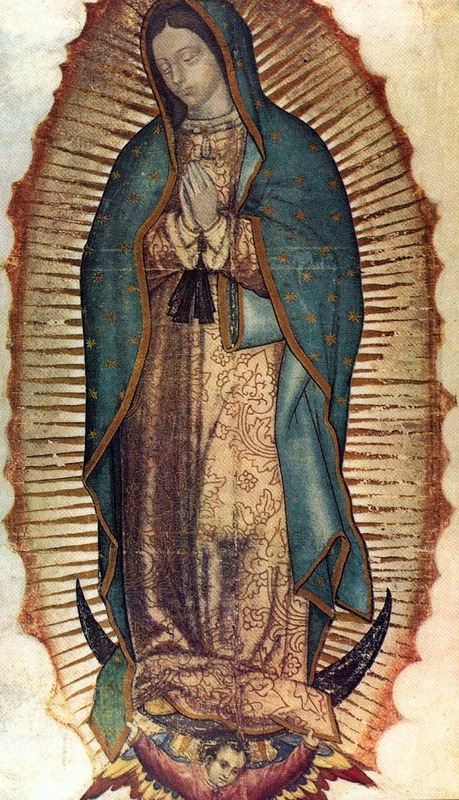 Some believe that Our Lady used the Aztec Nahuatl word of coatlaxopeuh which is pronounced "quatlasupe" and sounds remarkably like the Spanish word Guadalupe. Coa meaning serpent, tla being the noun ending which can be interpreted as "the", while xopeuh means to crush or stamp out. So Our Lady must have called herself the one "who crushes the serpent." We must sadly remember that the Aztec priest class executed annually at least 50,000 inhabitans of the land, men, women and children, in human sacrifices to their gods. In 1487, just in a single 4 days long ceremony for the dedication of a new temple in Tenochtitlan, some 80,000 captives were killed in human sacrifice. The same practices, which in most cases included the cannibalism of the victims' limbs, were common also in earlier Mesoamerican cultures, with widespread Olmec, Toltec and Maya human sacrificing rituals. An almost universal symbol of that religion was the serpent. The temples were richly decorated with snakes. Human sacrifices were heralded by the prolonged beating of huge drums made of the skins of huge snakes, which could be heard two miles away. Nowhere else in human history had Satan, the ancient serpent, so formalized his worship with so many of his own actual symbols. Certainly, in this case She crushed the serpent, and few years later millions of the natives converted to Christianity. Hi the archdiocese did contact me that same night. So I feel bad about writing this. After a brief email I was given mailing info to the same priest. I was surprised and delighted to hear from them . Due to protocol, I need to send everything that has transpired by hard copy. He apologize for what is going on and what has happened when I sought help. So I am in the process of doing that. Who would have thought I would get that response. I would appreciate it if you reajust the letter. Parish priest are not qualified to help. In a case like this one must go directly to the top. I am on a mobile I will email his department in a few minutes. I'll post your final response so people can see your process: the process of your being turned away by one priest and so having doubts about any other priests helping you, only to find very sympathetic ears when you look in the right place. That is very important for other people to read. That is really going to help other people. I think most people would have turned away from finding a good priest, but even though you were so discouraged (and completely understandably so) and under so much stress, you kept pressing forward. That is such a wonderful thing and a really good example for other people to not turn away from God and to seek out His help in a good priest. Undoubtedly people are going through the same thing with priests etc (even though parish priests can't do exorcisms, he should have still blessed your home and guided you towards help instead of yelling at you; it will be good for people to see that even if one priest yells at them, other priests will help). Glad you are finally getting help from the Church the way God intended for you to! You are doing a great job, keep going! Please always pray a little prayer for the sanctification of our priests.